The restoration of the SS Bigwin was made possible by the hard work and generous donations of many. In addition, the project has several key partners whose support has enabled the SS Bigwin to sail again. Many individuals contributed to funding the restoration. The SS Bigwin offers regularly scheduled public cruises, funded by your generous donations on the dock. The restored boat is beautifully crafted with extraordinary attention to historical detail. Departing from the dock in Dorset Ontario, and cruising down majestic Trading Bay with its tall white pines and towering cliffs, you’ll love seeing the beautiful Lake of Bays as other observers did in the first half of the 1900’s. Be sure to bring a camera to capture the splendour. The SS Bigwin is the perfect venue for your celebration! Private cruises can be booked for weddings, anniversaries, birthdays, reunions, and corporate functions. 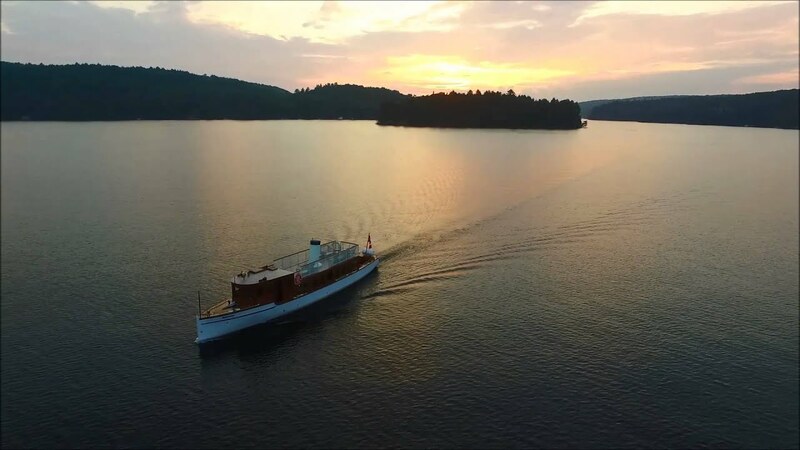 There was a time in the early 1900′s when the world’s elite travelled to the Muskoka Lakes (Ontario, Canada) in summertime to experience the beauty aboard majestic wooden steamships. The SS Bigwin is the last remaining steamship of the original fleet. It served as the ferry boat for vacationers and golfers to the famous Bigwin Island Resort – one of the most spectacular summer resorts in North America. With the decline of the resort half a century ago, the SS Bigwin fell into disrepair. After years of neglect, the boat sat partially submerged on the bottom of her slip at Bigwin Inn. A coalition of Lake of Bays cottagers, residents and organizations conducted a massive fundraising and restoration project to return this precious part of lost heritage for residents and visitors to Lake of Bays. On Saturday November 17th, 2012, at approximately 10:30 am, the SS Bigwin set sail on Lake of Bays and passed its preliminary engine tests. The ship launched officially to the public in July 2013, and is available to be enjoyed by everyone today and future generations tomorrow.